Your April ASERT Newsletter is here! Check out this edition to learn about Autism Acceptance Month, online Adult Autism Waiver request process, and the Inaugural State Policy Summit. You'll also find support groups, events and training opportunities from across the state! 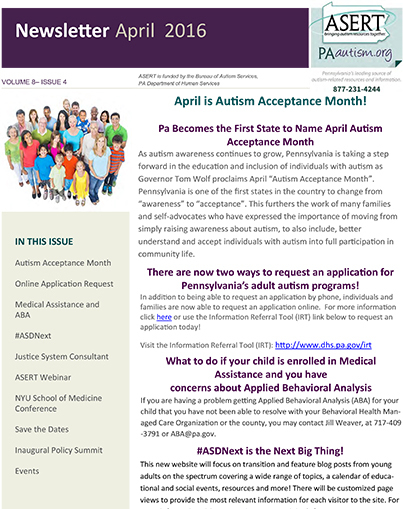 Check out PAautism.org for a full listing of Autism Acceptance Month events happening across the state in April! Funded by the Bureau of Autism Services, PA Department of Human Services.